Happy 2019 from Bluebird Hill Events! If you are anything like us, though, you probably are not ready to say goodbye just yet to the holiday season! 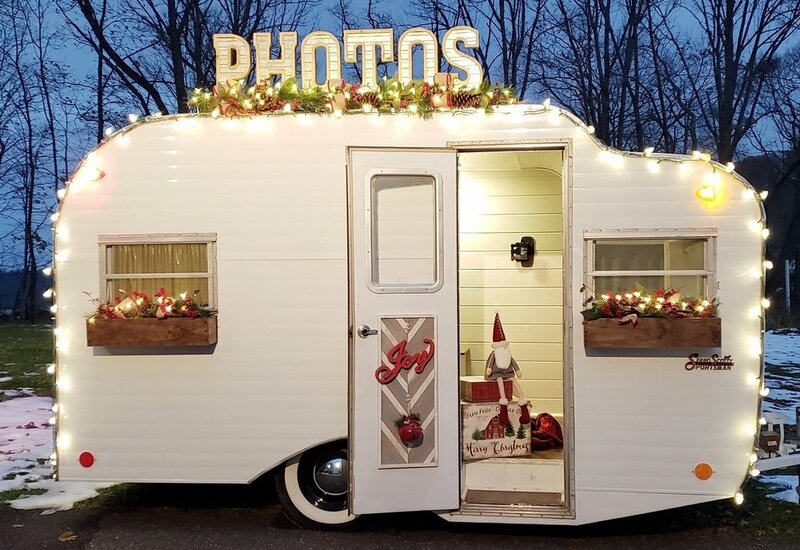 Our vintage camper photo booth, Pippen, made so many wonderful memories between Thanksgiving and Christmas, but even still, we could have happily had another month or two of such festive celebrations! Pippen was beautifully decorated with some festive, rustic holiday décor inside and out! Of course we had to feature all our beautiful (and some very silly) holiday-themed props as well, and our vintage camper elf, Cornelius! Pippen in her holiday trimmings! Pippen’s first holiday season was made even more special because we spent so much time in our hometown of Clinton, New Jersey. If you have never been to Clinton, particularly during the holidays, you are missing out! We have a historic and picturesque Main Street filled with great shopping, coffee houses, restaurants and bakeries. 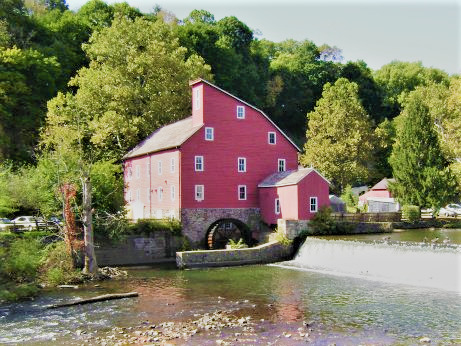 Even if you haven’t visited, I’m almost certain you have seen photos of it, in particular our wonderful Red Mill Village Museum, located across the South Branch Raritan River from downtown. Look familiar? Clinton kicks off it’s magical holiday season right after Thanksgiving, with Dickens Days on the Friday through Sunday after Turkey Day. Some highlights of Dickens Days include horse-drawn carriage rides, carolers, visits with Father Christmas and more. Over the river at the Red Mill Museum, the Festival of Trees was set up, where visitors tour the historic mill museum among dozens of hand-decorated Christmas trees and wreaths made by locals in a fun competition. Cornelius - our vintage camper elf! 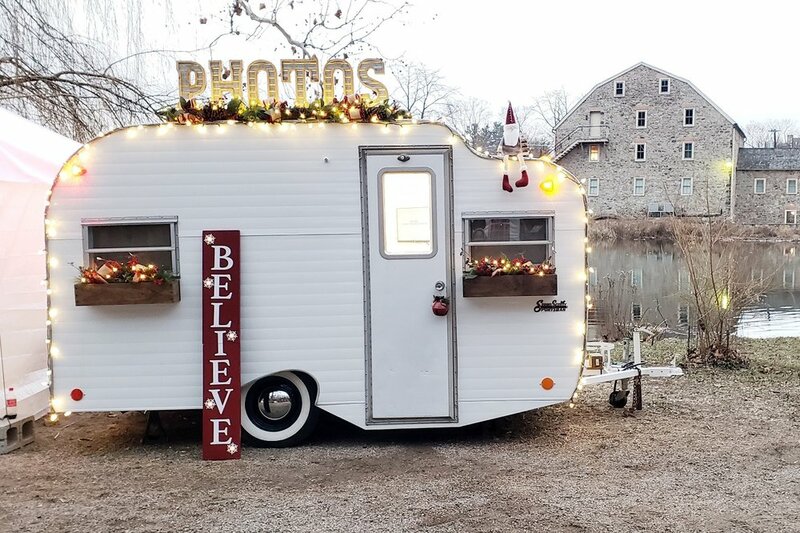 Our vintage camper photo booth, Pippen, joined in the Dickens Days festivities on Saturday and Sunday and set up at the Red Mill Village Museum! Saturday was the inaugural Winter Village Outdoor Market, hosted by our good friends at Marketspace Vendor Events. The Winter Village market had two giant heated tents set up with only artisan crafters, food trucks and lots of holiday fun! There was no better way to spend Small Business Saturday than to get some quality shopping in, and then pop on over and have your picture taken in the booth! The event was a huge success and we can’t wait to do it again next year! On Sunday we kept the shenanigans going and the weather was just perfect to take in the last of Dickens Days fun. Pippen setup and ready at the Holiday Marketplace with the Clinton Art Museum in the background! We rounded out our holiday season with some great private holiday parties and were so happy that the weather (mostly) cooperated! Here are some favorites from in the booth, with everyone enjoying our holiday props. As hard as it is to say goodbye to the holiday season and the memories from 2018, we are beyond excited for what is in store for 2019! We have so many awesome weddings, events and celebrations already on the calendar, and we’re looking forward to adding more! We would like to wish our clients, vendor friends, regular friends and families the Happiest New Year from our family! The Red Mill Museum: www.theredmill.org Please take a moment to check out their current fundraising campaign, #savethewheel at savethewheel.org.